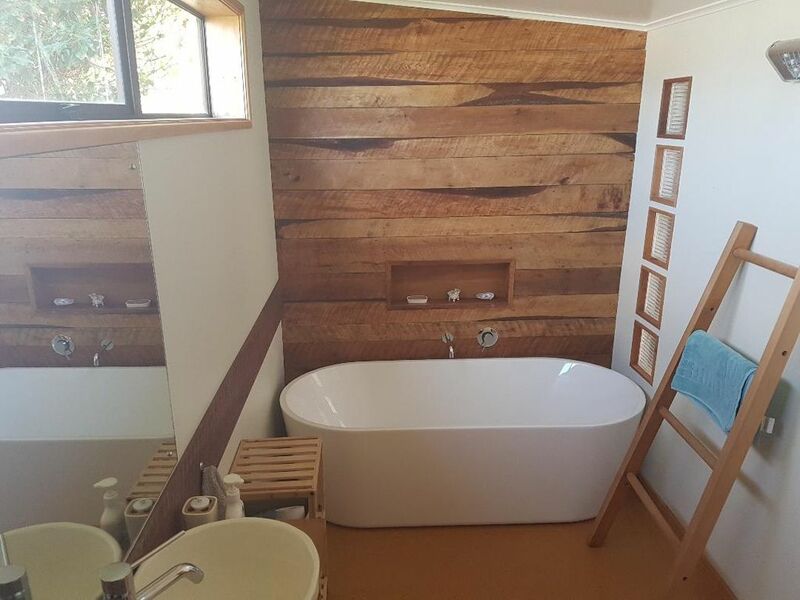 Southland beech timber is a feature of this recently renovated traditional-style Kiwi bach. Only one street back from Taramea Bay beach, the house is nestled in a private garden setting and is a lovely place to relax and retreat after a day in the sun. The bath and ‘shower room’ are special features, and there's gas hot water. Riverton has a great range of restaurants and cafes. The Beach House Restaurant is a 10-minute stroll away along the beachfront, and Taramea Bay takeaways is only five minutes walk away for fish and chips on the beach. There is a children’s playground and plenty of room to run around at Taramea Bay. The sand slopes very gradually out to the sea, so when the tide is in the shallow water is very safe for swimming. A walking track hugs the coast almost all the way along the waterfront to the more rugged south coast and you can see Stewart Island from there. Drive up to Mores Reserve and a short walk to a lookout provides fantastic views over the Riverton Estuary, West to Colac Bay and south to Stewart Island. For rainy days there are plenty of books, a blu ray player and freeview tv, games and even a piano to tinkle. And there are two lounge areas separated by a door - ideal to keep both readers and television watchers happy. PLEASE NOTE: As is the Kiwi bach tradition, you are expected to clean the house and do the dishes before you leave. 2 minutes walk to the beach and 5 minutes walk to the Taramea Bay store for ice creams or fish and chips. There is no view of the sea, but the nearest beach is a 2 minute walk away. The house has views of the garden. All heating is electric. The best heater is in the tv room. Please don't leave this on overnight. The other rooms have wall panel heaters that can be left on. There is room for several cars on the driveway. Please don't park on the grass as it can be wet and you might get stuck! There are two lounge areas with a door separating them. There are dishwasher tablets under the sink. Please make sure the fridge and freezer are empty when you leave. Stove top espresso and coffee plunger available. There should be salt, pepper, sugar and oil available for guests to use. If not, we apologise it hasn't been replaced. It's an 'extra' rather than guaranteed. There is a dining table with view to the garden separate to the kitchen. Freeview television is available and DVDs. A terrific bath. Amazing shower and plenty of room. Comfortable beds, but needs a spring clean. A beautiful area. So much to do and see. Great location, and has everygthing you need. A great property - so well maintained and had everything we required. Thanks so much. Great space, nice comfortable stay. Great space, nice comfortable stay. Felt very homely. Thanks!